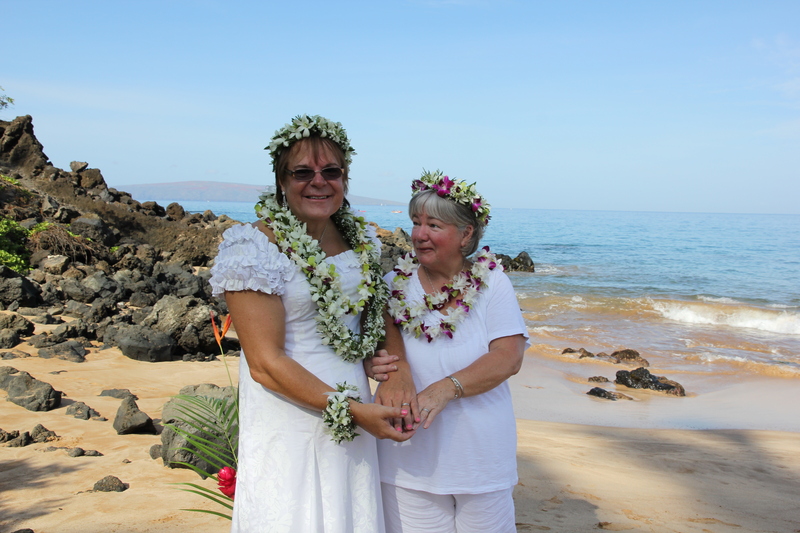 On May 4, 2014, Lisa and I were married at Palauea Beach, Makena, Maui. I included some pictures and the wording from our wedding which also includes explanations and meanings of the various ceremonies that were a part of our wonderful day. Enjoy ! Here I am, all ready and waiting for Lisa before we start. She was still making sure everything was set-up and ready to go! We are all ready to start! Somehow, you can just see me under all those flowers! 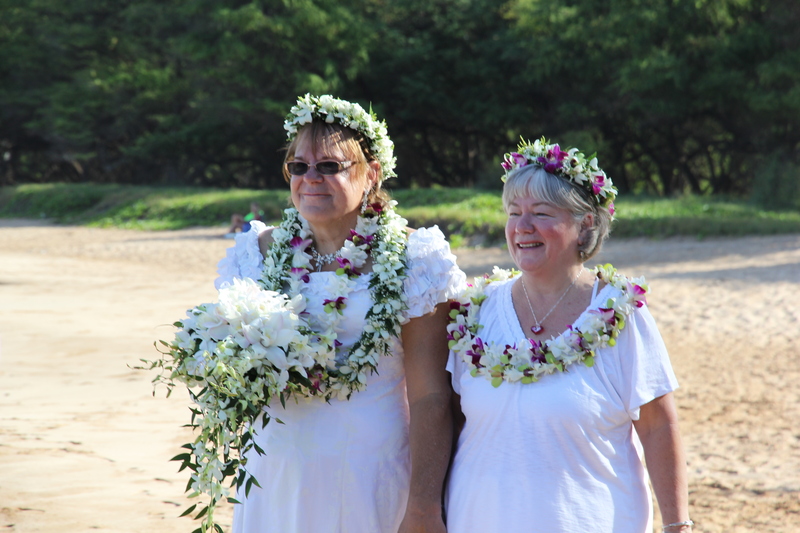 Both of us are wearing two Lei’s (one for exchange during the ceremony) and Haku’s (head Lei’s). 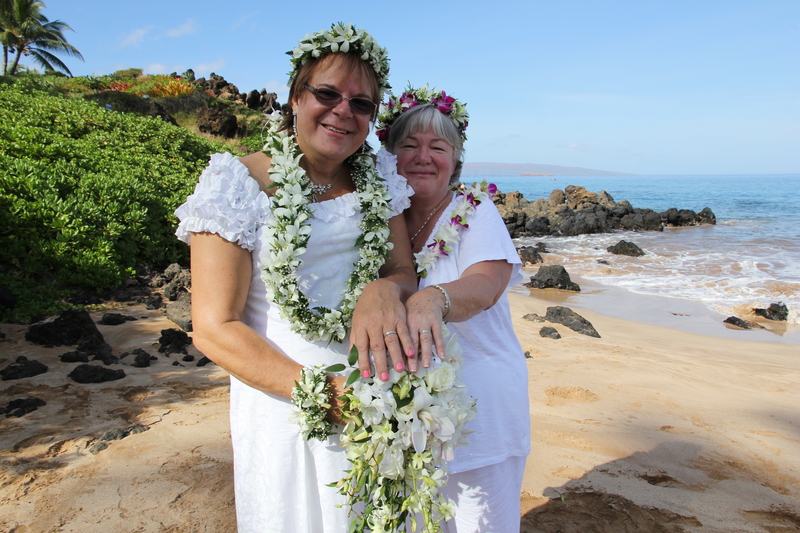 I am also wearing a Kupe’e (small Lei) on my wrist and my ankle and I have a cascading bouquet. My dress is a stylized holoku (Hawaiian style dress modified for a wedding – it has a beautiful white floral pattern on a sheer layer with ruffled cap sleeves). Our guests patiently waiting for the Kahu to blow the conch shell to start the ceremony. “No Pu” (stop laughing – it means the blowing of the conch shell to call people together for a sacred event). This was our signal to walk up to the gathering. We take our places on the beach between two flower arrangements with a ‘sacred’ bundle containing important items from our past, commemorating people that could not be here, loved ones past or important events in our lives. Kahu Kimo then did the most awesome chant. It sent chills up our spines and made both of us cry. 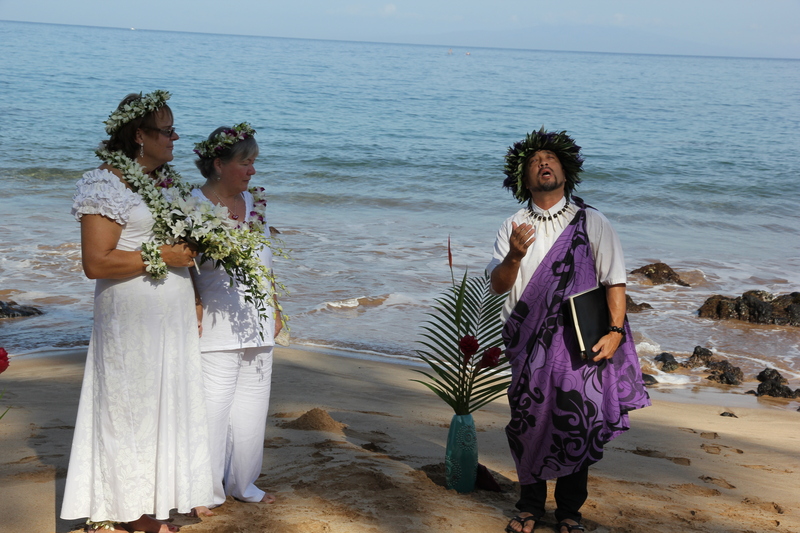 He has a powerful voice and a Hawaiian marriage chant is powerful and beautiful. 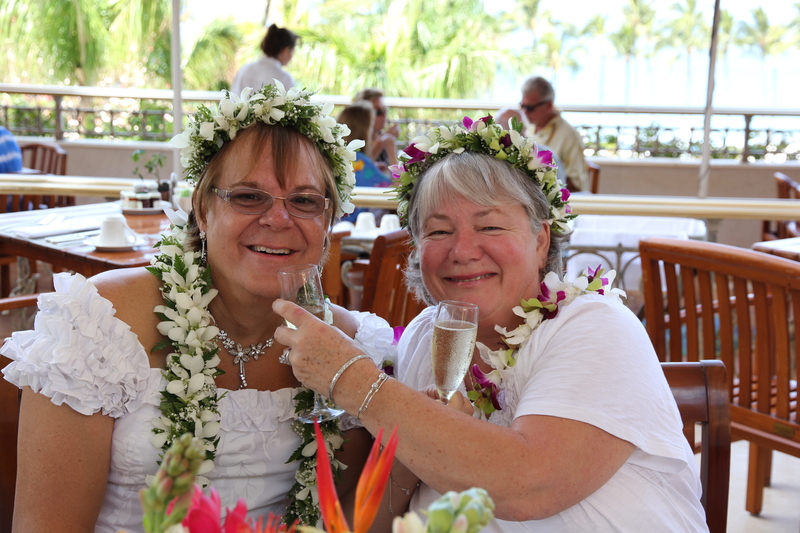 After wearing each other Lei’s (imbuing them with our essence) we exchange them – symbolizing giving of ourselves to the other. A good friend of ours turned this Koa wood bowl. We were able to pick out the wood for it. The Kahu dipped this in ocean water for this part of the ceremony (see below for an explanation of the symbolism along with a transcript of the ceremony). At this point, we place our rings into the ocean water along with a rock that was selected from this place. 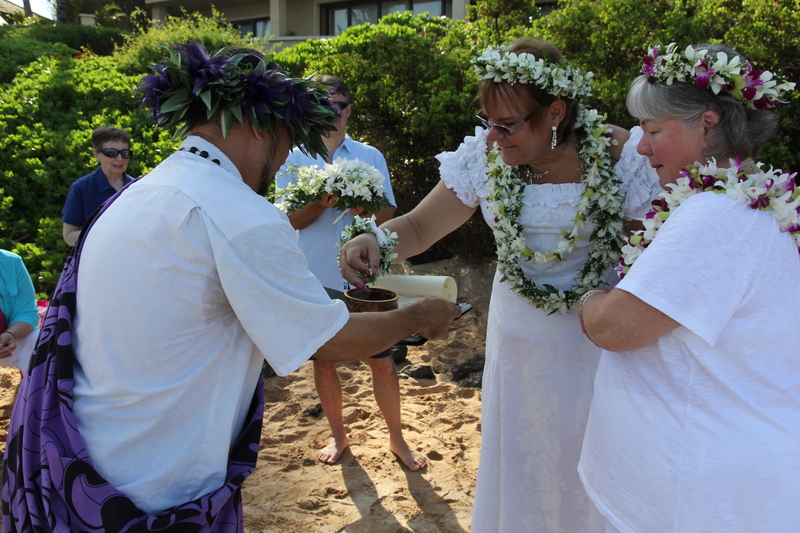 This is a special Hawaiian blessing ceremony. place it on her finger as I state my vow (see below for the transcript). 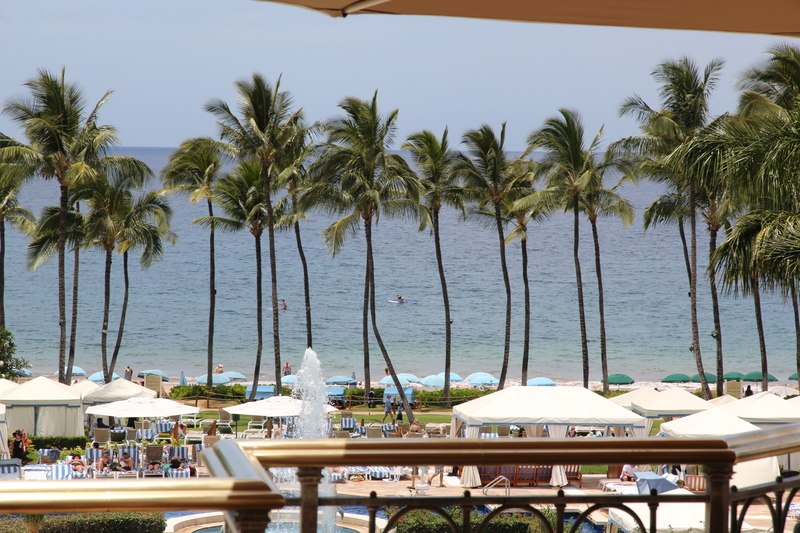 The Kahu pronounces us “Maui’d” !! Kahu Kimo and my sister tie a Ti leaf around a lava rock that was selected from this beach and soaked in the Koa bowl. 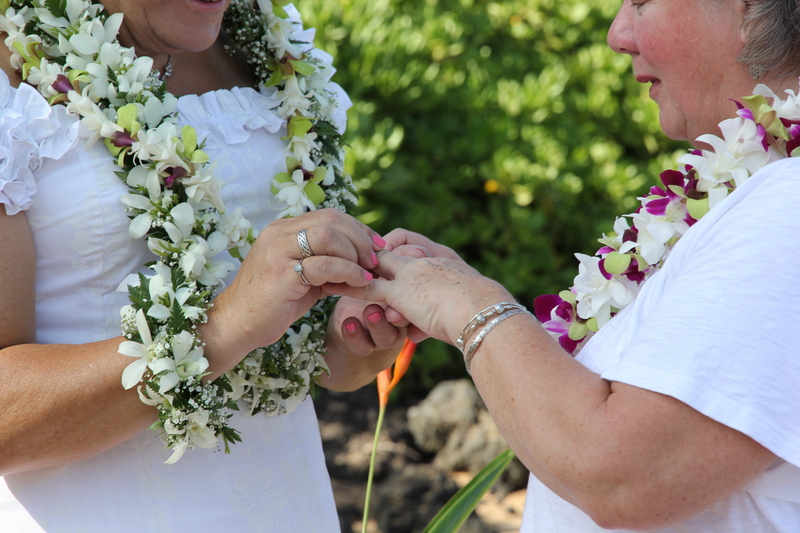 We wear the rings forever but we will take this rock and place it somewhere on Maui as a connection to this sacred place and time. 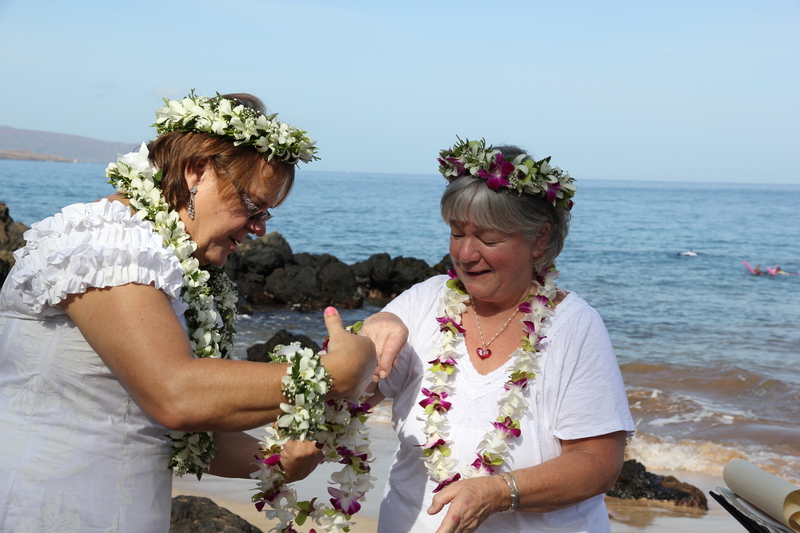 The Lei’s that we exchanged are now tied together and cris-crosses our arms signifying we have just been joined together. 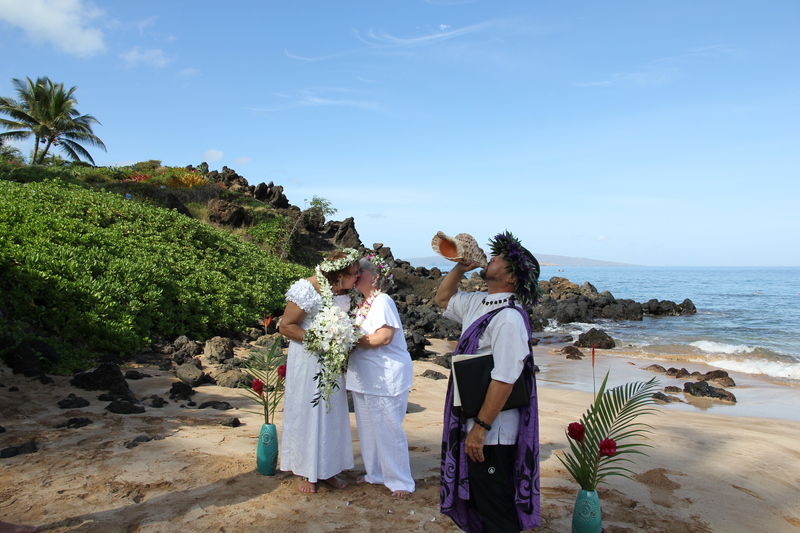 And the Kahu chants “Honi Ka Wa’a” (kiss on the lips) and blows the conch shell. Lisa signing the official documents. Ta Da !! 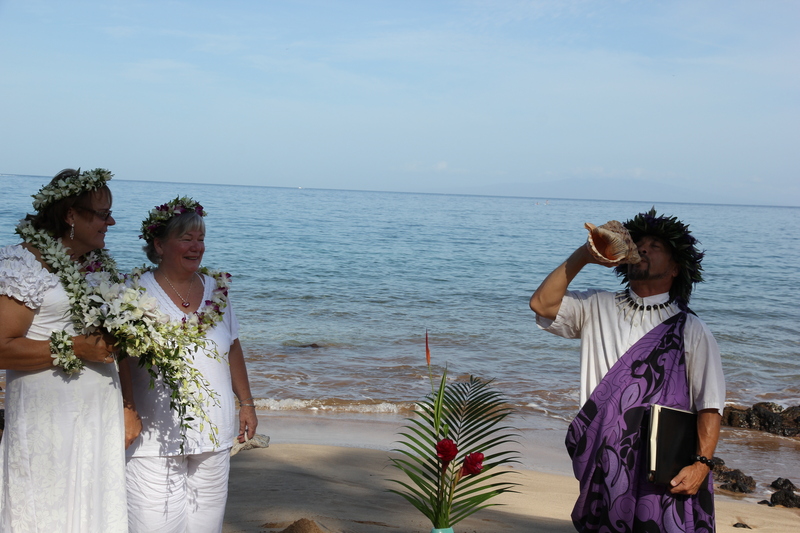 Officially married (errr Maui’d that is). Sparkling wedding bands to prove it. We did it !! Kahu Kimo giving the shaka for a awesome ceremony! 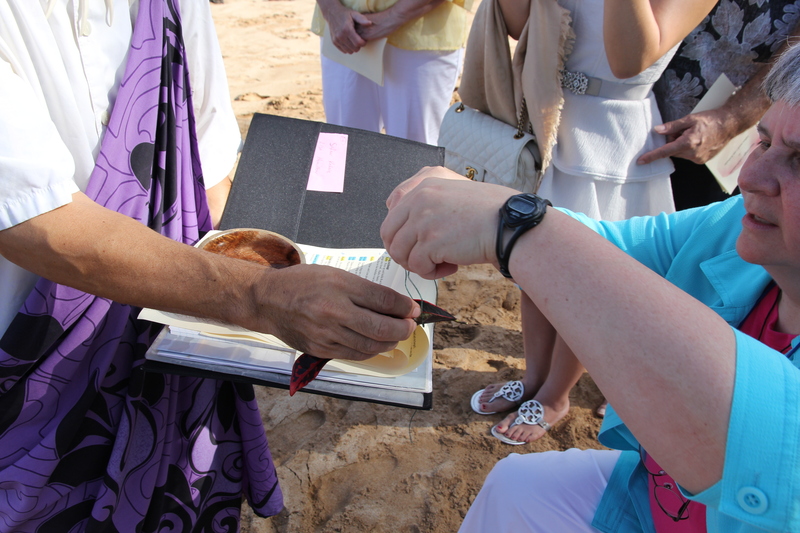 Pouring the ocean water back into the sea after the blessings. 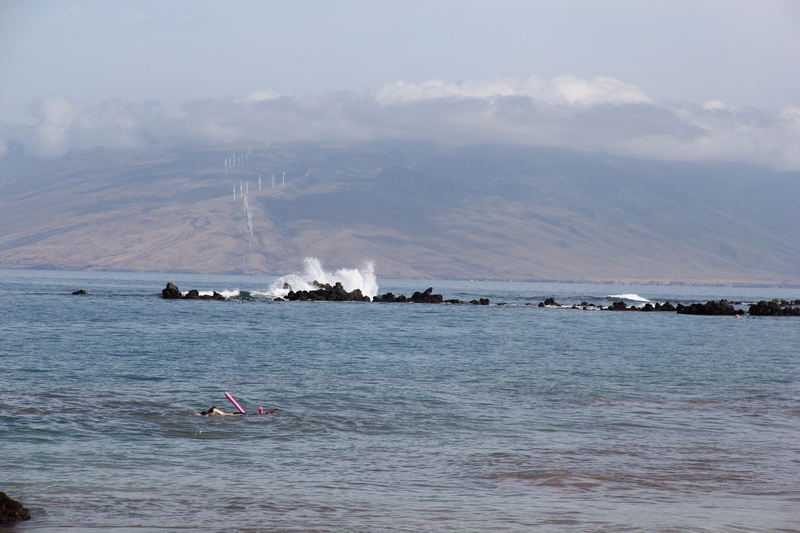 View out over the ocean, waves crashing over the lava rocks and west Maui mountains in the background. This is the view my partner and I had during the ceremony. 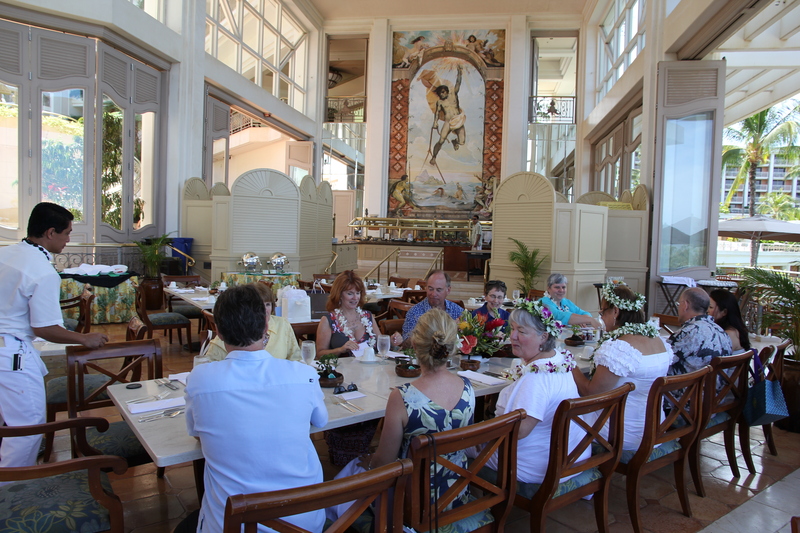 We had a champaign brunch at the Grand Wailea hotel, where else but in Wailea of course. The traditional campaign toast – each of us holding the stem-ware for the other. 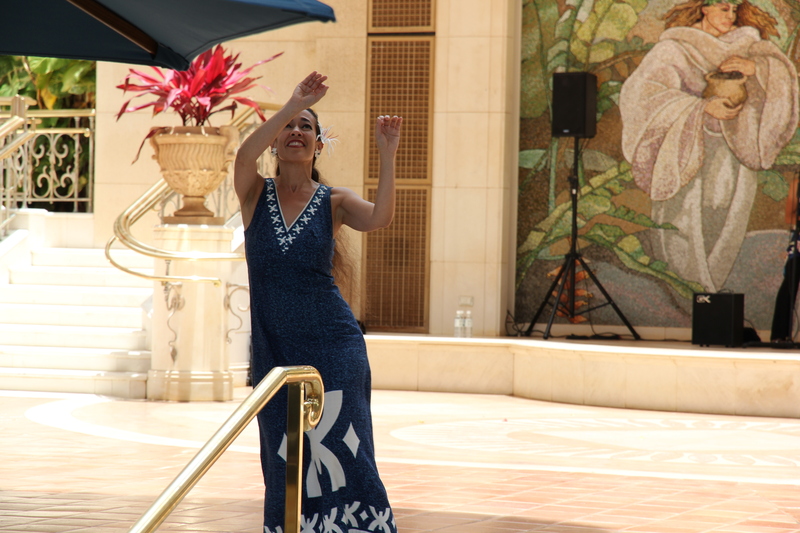 The brunch at the Grand Wailea includes a Hula performance and band. As we left, someone tipped off the Hula band that we were just married. They played a song just for us to dance too. Even though we did not have a formal reception – dances etc. – we still got to dance our wedding dance! How beautiful can it be? The rest of our guests surrounded us and applauded along with most of the people there! 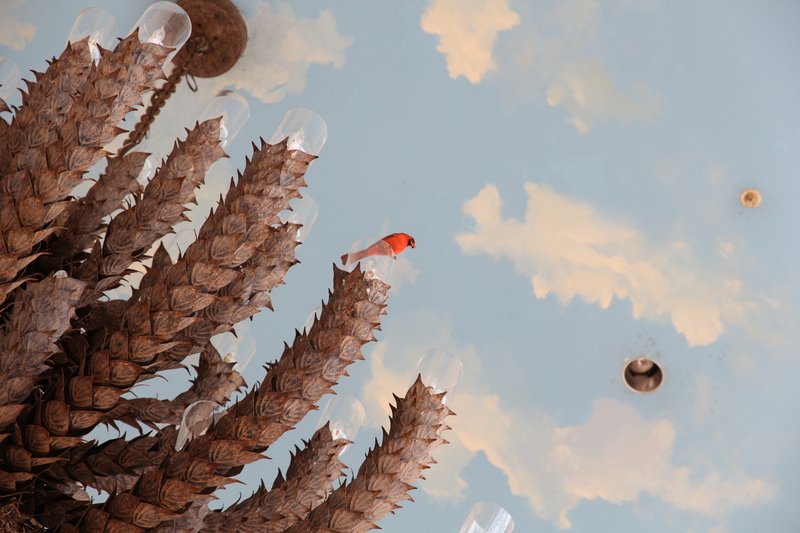 Spotted a cardinal sitting on the chandelier above our table. How perfect to be serenaded by such a beautiful bird. 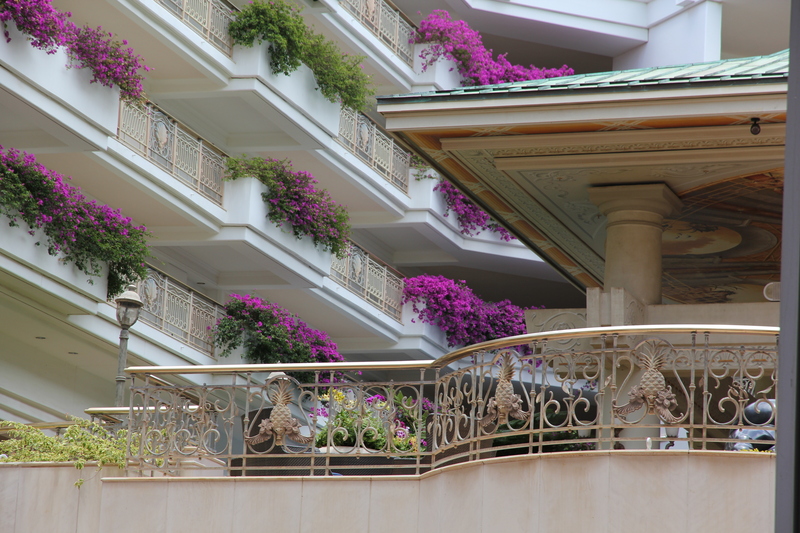 A view of the inside of the Grand Wailea with the balconies flowing with flowers. Looking out the other direction to the impressive grounds and the ocean. 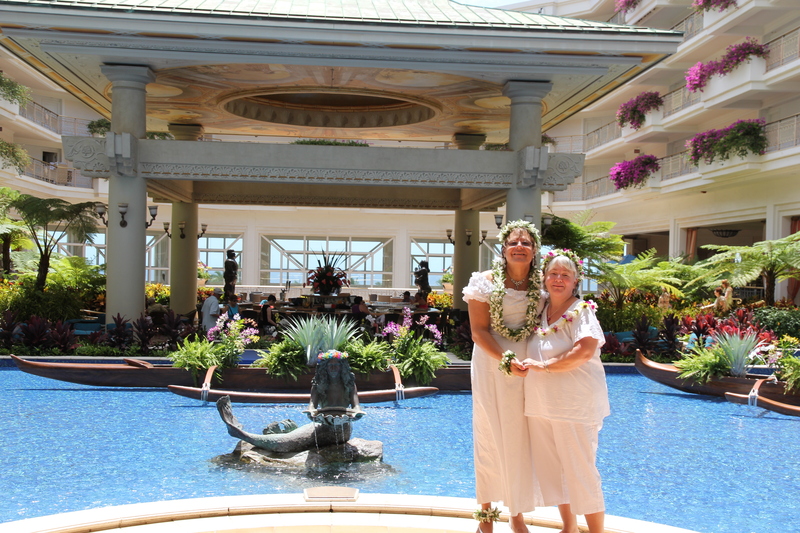 Here we are after the brunch at the entrance pool of the Grand Wailea hotel seeing off our guests. What a gorgeous, beautiful wedding. 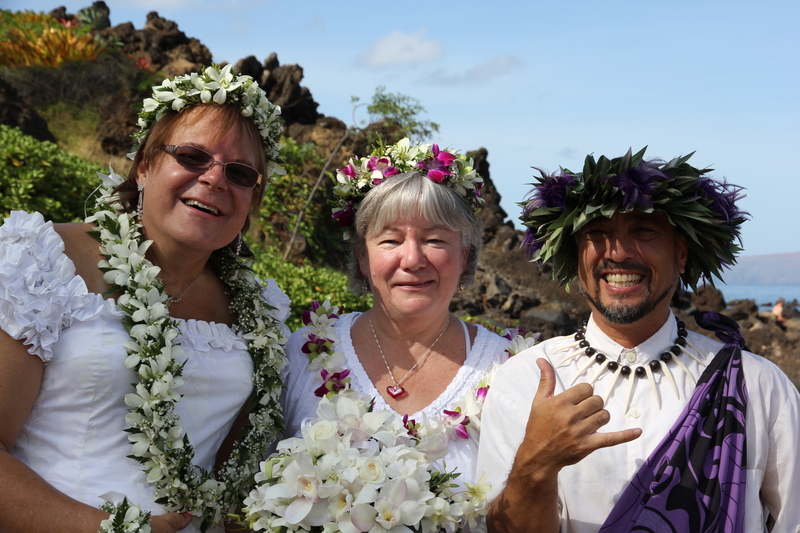 Hawaiians have always had a sensitivity to the sacredness of special times and places. 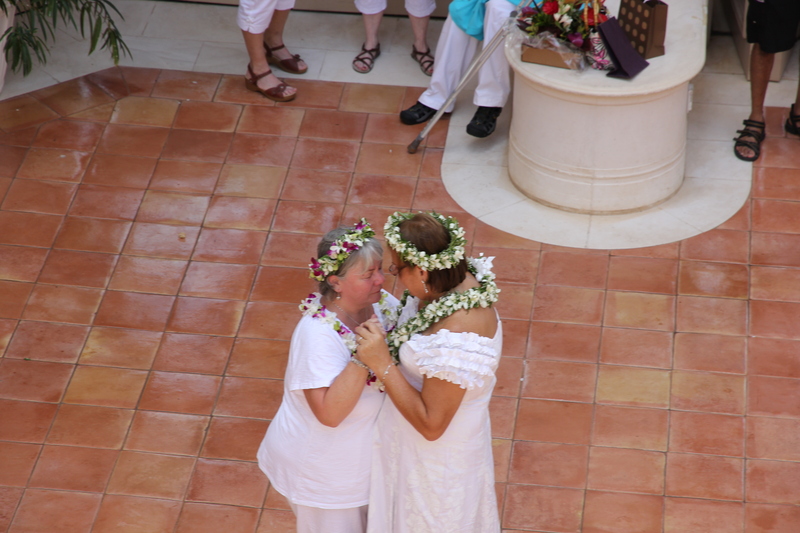 Of all the places Sifan and Lisa could have chosen, they were guided to be right here today and this becomes a sacred place because of their love and the vows that they are sharing. 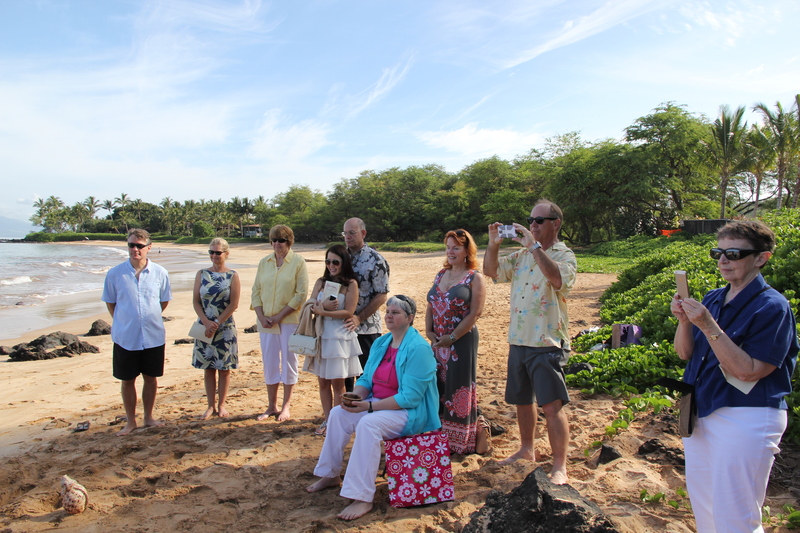 The Kahu selected a lava rock from this place to perform a short blessing during this ceremony. There is an additional significance as well. We see only the surface of the land. Below, unseen, is the power and depth of A’ina. So too, many others will see the outer expression of their love for each other, but only they know the true and unseen depth of their inner union, that profound place in the heart where they have been strengthened and enriched by love. 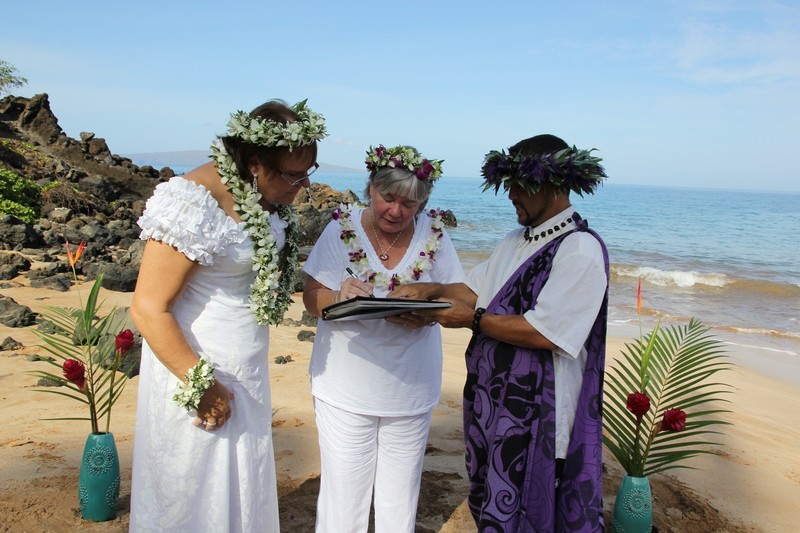 This can also be compared to the beauty of the Pacific Ocean surrounding us here on Maui, which they have chosen as the backdrop to this ceremony. We see constant changes on the surface of the Kai (sea), but below, unseen, is an almost infinite depth, abundant, teaming life. Life requires constant attention to the surface details of career, family and daily life. For all of this they are drawing from an inner depth, what the Hawaiians call Mana, guidance and direction for the decisions of life. In addition to the A’ina and Kai, there is the beautiful Mauna (mountain) that we are standing on: Haleakala. Telescopes are looking outward and upward, making new discoveries there every day. We talked about your inner love – this Mauna suggests the importance of looking outward to the circle of family and friends that surround us. These are called Ohana One tradition says that at a wedding the stirring of the wind represents those absent loved ones who join us in this joyous celebration. We are the ones blessed to be present, but we give thanks and express appreciation for those others who have been such an important part of bringing them to this loving moment. 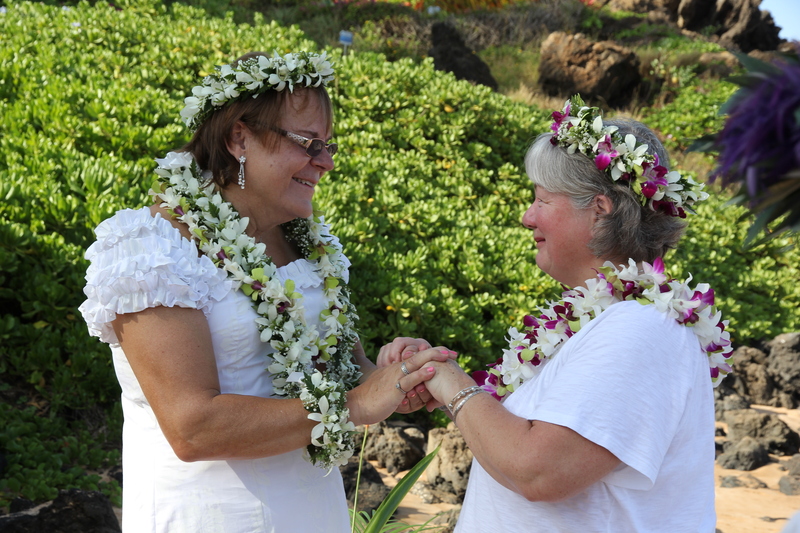 These Leis remind us of the dynamics of a healthy relationship. They represent the giving and receiving of a gift from the heart. Sometimes the simple gift of a flower says how much you mean to each other, that you want your relationship to continue to blossom, to be fragrant, to grow. Kahu: “!!Aloha!! Welcome to the celebration of the love and marriage of Sifan and Lisa. The Hawaiian word, “aloha”, literally means to give and share the sacred breath of life. It’s a greeting, it means “love”, but it means much more than that. To greet someone with aloha is to greet them with the essence of life – our breath. No other language has such a personal, intimate, spiritual greeting. ‘HA’ is the breath. These islands are named for that as well. Let us share the aloha now by taking a moment to breathe deeply together. It is relaxing, cleansing and calming. 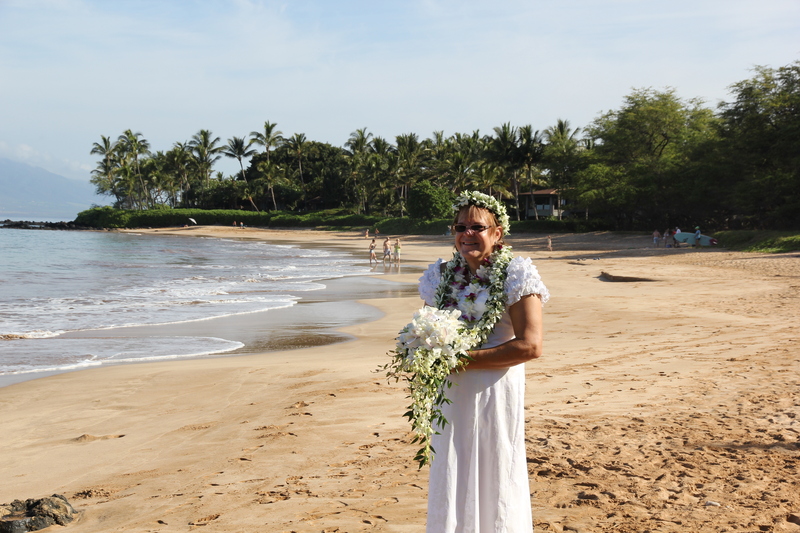 Be aware of the tropical breezes, for the Hawaiians believe that carried on the winds at a wedding are the spirits of absent loved ones: ancestors, those who have passed, friends and family that are not able to attend. 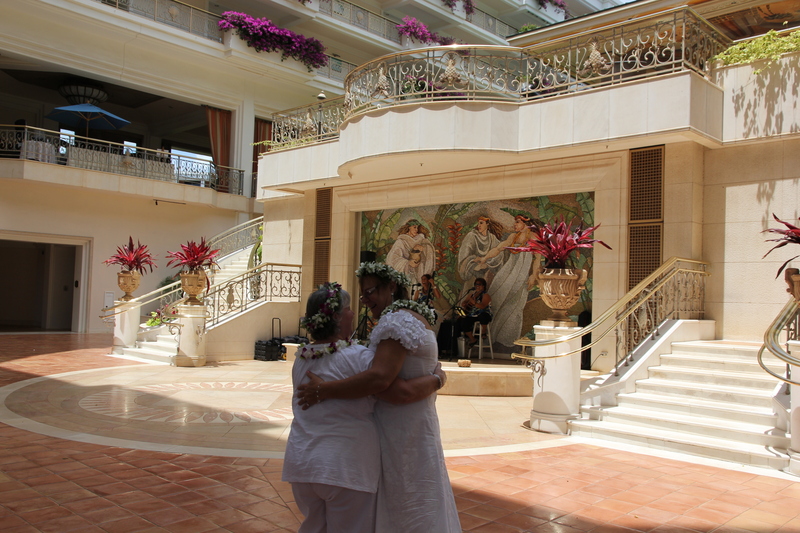 Feel their blessing caress your face as we share an aloha breath. At any time during the ceremony, should you become strongly aware of the breeze, consider it to be the blessing presence of a loved one here in spirit. Shortly, Pu, the blowing of this conch shell, will invoked their presence. 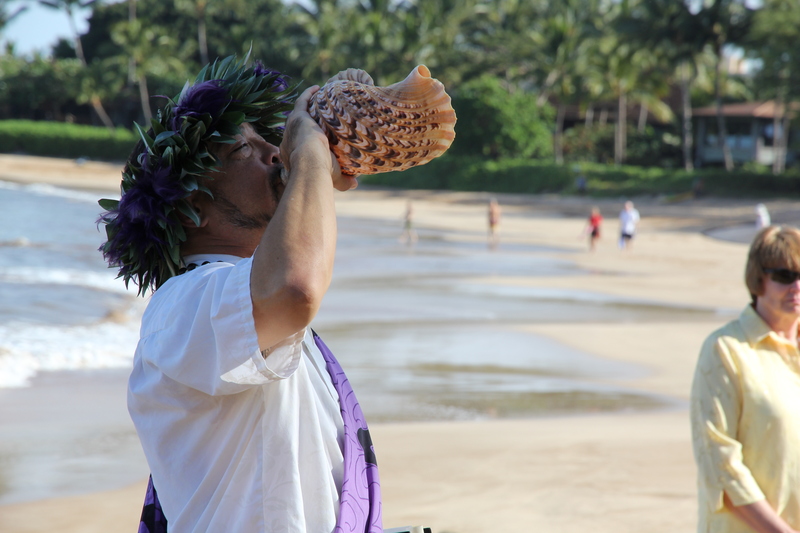 Kahu blows a conch shell as Sifan and Lisa approach. Kahu: “Marriage is a commitment to life, to the best that two people can find and bring out in each other. It offers opportunities for sharing and growth no other human relationship can equal, a physical and emotional journey that is promised for a lifetime. Within the circle of its love, marriage encompasses all of Life’s most important relationships. A couple are each others best friend, confidant, lover, teacher and listener. There may come times when one partner is heartbroken or ailing and the love of the other brings healing, steadfastness and comfort. Marriage deepens and enriches every facet of life. Happiness is fuller, memories are fresher and commitment is stronger. Marriage understands and forgives the mistakes that life is unable to avoid. Yet it encourages and nurtures new experiences, new ways of expressing love through the seasons of life. When two people pledge to love and care for each other in marriage, they seem to create a spirit unique to themselves which binds them closer than any spoken or written words. Marriage is a promise, made in the hearts of two people who love each other and will take a lifetime to fulfill. Kahu picks up and holds Koa bowl with Ti leaf and ocean water. Lisa and Sifan place each others rings into bowl. 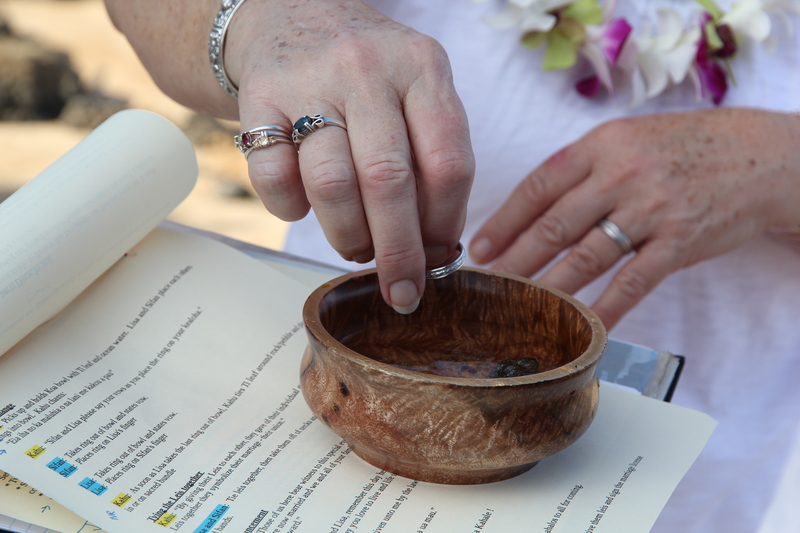 The Koa wood bowl was dipped into the Pacific Ocean in order to perform a Hawaiian blessing over their rings. Koa, which is the hardest of our Hawaiian woods, has been used over the centuries to build the outrigger canoes, tools and utensils. It has come to represent integrity and strength; foundational qualities of a relationship. Marriage is more than just the beautiful passion and tender emotion of love. It is a covenant enduring all of life’s changes, based on faith, hope and love. The Ti leaf represents prosperity, health and blessing of body, mind and spirit. The water has a double significance. One is a washing back into the Pacific, symbolically, of any hindrance to relationship, disappointment or hurt from the past. 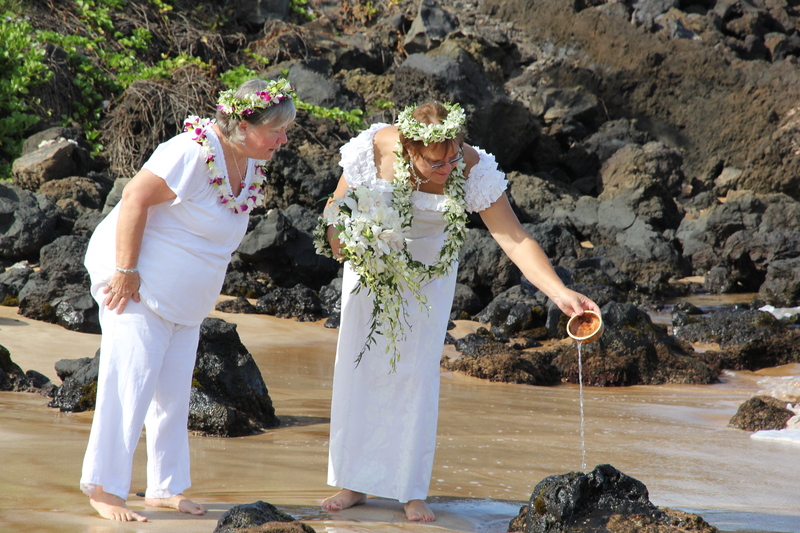 In Hawaiian this is called Ho’oponopono (reconciliation), a letting go by grace and aloha so that the second aspect of the water may be profoundly true for the two of them today: it represents a brand new beginning in married life. 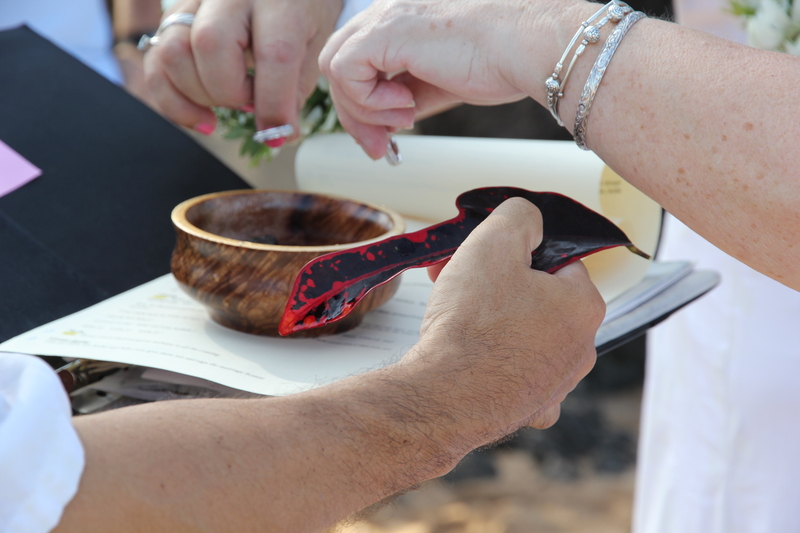 The Kahu takes this lava rock and Ti leaf to perform an Hawaiian blessing. The rock represents this moment and the place of this marriage – made sacred by their love. Wrapped in the leaf it is a traditional Hawaiian offering, prayer and blessing. They will place it somewhere special to them on the island. Their rings are with them everywhere they go, a reminder of their marriage and love. The rock marks their entrance into a promised land, that of marriage, full of rich promise and unlimited potential. They will be keep this along with the sacred bundle as a celebration of this event. 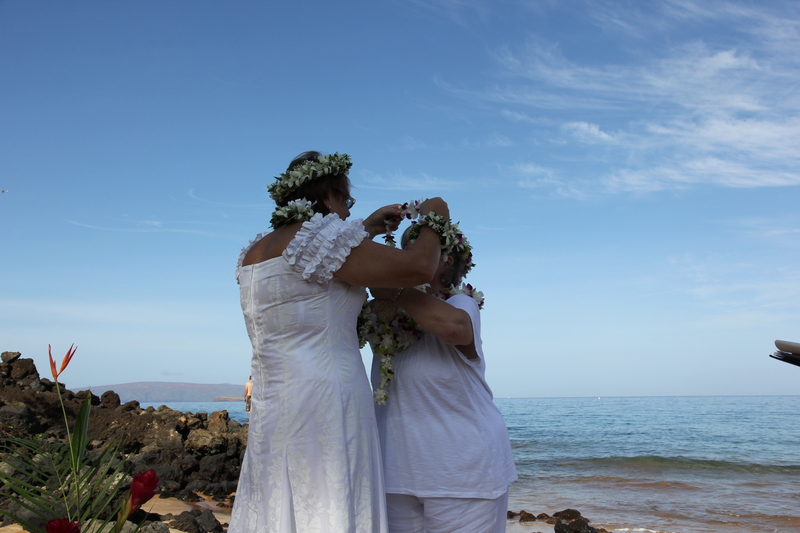 Now, by the power given unto me by the laws of this State of Hawaii: I now pronounce that you are married. I present to you: Sifan and Lisa ! Kahu blows conch shell as Lisa and Sifan retire. Sifan and Lisa pour the ocean water in the Koa bowl back into the Kai. 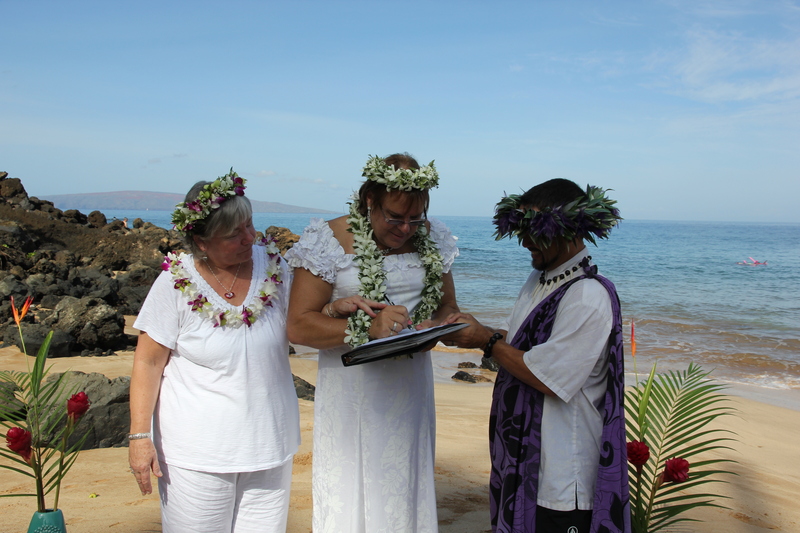 Posted in About, Diary and tagged Beach Wedding, Being Female, Gender Change, Maui, Transgender, Transgender Wedding, Transition, Transsexual, Transsexual Wedding, Wedding. Bookmark the permalink. Wonderful pictures and narrative! Julia and I think Shutterfly might be the best way to go to post pics from us as it has unlimited number and is free. We will do our best to get these out next week. Heading for a weekend conference tomorrow, back on Sunday. Aloha sent this evening from Virginia. Back in a couple of weeks. What a wonderful wedding ceremony!